The long-standing, more mythical than fact-based assumptions about ancient trade contacts between West Africa and the wider world prior to the Arab conquest of North Africa have only been substantiated by archaeological evidence in recent years. Although the number of imported items known to have been brought into West Africa during late Roman and Byzantine times just started growing, the mechanisms of their diffusion are still far from being understood. 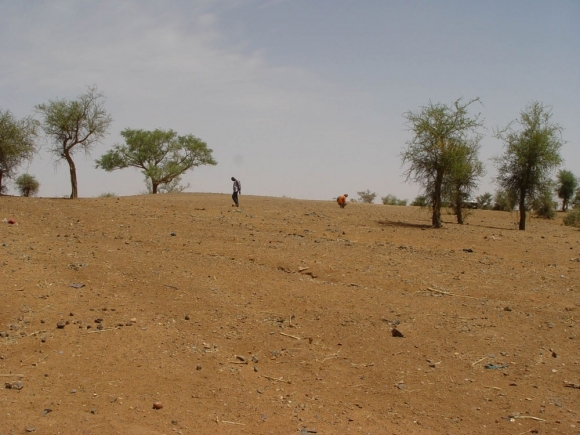 This can mainly be set down to the dearth of convincing material evidence from other archaeological sites in West Africa, the Sahara and North Africa — the result of a lack of research and, perhaps too, of trade in “invisible” merchandise Previous archeological studies on this topic are discussed; and the preliminary findings of recent research in the eastern Niger Bend, presented. Les présupposés de longue date – plutôt mythiques que fondés sur des faits – à propos du commerce entre l’Afrique occidentale et le reste du monde avant la conquête arabe de l’Afrique du Nord n’ont été que récemment étayés par des travaux archéologiques. Bien que les découvertes d'articles importés, connus pour avoir été acheminés en Afrique de l'Ouest pendant les périodes romaine tardive et byzantine, sont, depuis peu, de plus en plus nombreuses, nous ne comprenons pas toujours les mécanismes de diffusion de ces derniers. Cette incompréhension est avant tout liée au manque d’indices matériels probants provenant d’autres sites archéologiques en Afrique de l’Ouest, au Sahara et en Afrique du Nord. Cela résulte à la fois d’un manque de recherche et, peut-être aussi, du commerce en marchandise “invisible”. Les études archéologiques antérieures sur le sujet sont ici discutées ; et les résultats préliminaires de recherches récentes dans la partie orientale de la boucle du Niger sont présentés. Was there a pre-Arab gold trade? 1 N. Levtzion, J.F.P. Hopkins, 1981, p. 24. 2Before the first Arab textual sources appeared towards the end of the first millennium AD, virtually nothing tangible was reported on the regions beyond the southern fringes of the Sahara.3 When Arabo-Islamic armies conquered North Africa in the 7th–8th century AD, accompanying merchants accessed the roads to the West African Sahel region soon thereafter. Over the subsequent centuries the organised Trans-Saharan trade developed quickly and reached a first peak in the early second millennium AD. Coming back to Antiquity, we shall pose the question as to whether trans-Saharan trade contacts prior to the Arab conquest of North Africa, yet not unambiguously traceable by written sources, are detectable archaeologically. Making no claim to be complete, this brief paper provides an insight into the current state of our knowledge on what can be called the ‘archaeology of first contact’ between people living on both sides of the Sahara. First we will discuss the still meagre but growing evidence available on this matter for the southern fringes of the desert and then take a look at the results of research carried out to the north. The paper concludes by tackling the long-standing discussion on a possible pre-Arab trans-Saharan trade in gold and introducing the initial results of new research on this subject. 4 Cf. e.g. P. Salama, 1981; J. Devisse, 1992. 5 S. Magnavita et al., 2002; S. Magnavita, 2006. 6 S. Magnavita, 2006, 2009; P. Robertshaw et al., 2009. 7 T.R.Fenn et al., 2009. 3Up to the 1990s, scholars practising the still comparatively young discipline of African archaeology concluded that pre-Arab trans-Saharan trade enterprises that might have been of any economic importance were either non-existent or did not leave visible traces in the West African Sahel.4 In 1996, the discovery of the Iron Age cemeteries of Kissi in Burkina Faso again brought to mind the prospect that the general lack of archaeological evidence for a pre-Arab trans-Saharan commerce is more probably a by-product of research deficit than a matter of fact. Excavations at these sites revealed that a number of valuable goods from various parts of Africa and the wider world were finding their way into the West African Sahel earlier and, more importantly, on a larger scale than previously thought.5 All in all, thousands of beads made of different materials (figure 1), more than a thousand of them being of glass, as well as brass jewellery (figure 2) and cowries were found among other goods brought to the Sahel from far distant regions. While the cowries were identified as Cypraea moneta, deriving most likely from the Indian Ocean, the origin of the glass used to manufacture most of the glass beads was chemically traced to the Middle East6 and some of the tested copper alloys to regions along the Mediterranean Sea, possibly including Carthage.7 Other objects of likely northern origin found at Kissi include the first known West African swords as well as curved daggers and wool textiles, most of these dated to pre-8th century AD contexts. Photo: B. Voss, University Frankfurt. 8 S. Magnavita, 2006, 2009. 10 S. Magnavita, 2006, 2009. 13 R.H. Brill, 1995, p. 254-255. 15 See also K.C. MacDonald’s recent publication on this topic (K.C. MacDonald, 2011). 17 B. Gado, 1993, p. 369; B. Gado et al., 2000, p. 228. 6In addition to these locations, there are a number of West African archaeological sites or finds related to long-distance connections, but their insecure dating or context make them less valuable for the scope of the present discussion. Two examples of such evidence come from the Niger Republic: the necropolis of Bura Asinda-Sikka and the statuette from Zangon Dán Makéri. The famous necropolis of Bura Asinda-Sikka in Southwest Niger is approximately dated both via C14 on charcoal and geological surveying to between the 3rd and 13th or 3rd and 10th–11th centuries AD.16 It revealed anthropomorphic and zoomorphic terracotta figurines connected with inhumations, many of which were accompanied by grave goods such as copper-alloy jewellery, iron weapons and beads.17 Among the latter are also numerous glass beads.18 The depiction of horses and the presence of glass and copper-based objects at the site clearly indicate links to North Africa; however, their exact age could not be ascertained yet. New, reliable absolute dates are indeed urgently needed. Work on this is currently being undertaken by the author, as datable organic fibres (mainly of woven textiles) were found adhering to some metal grave goods during an inspection of finds excavated by the Institut de Recherches en Sciences Humaines, Niamey, in the 1990s. 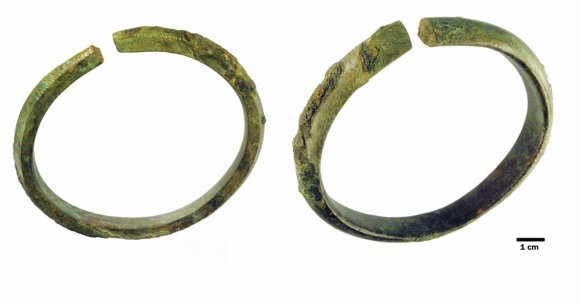 Beyond that, chemical analyses of copper and glass from dated contexts might help to trace the origin of some of the selected objects. This research is at its beginnings and results will be published in due time. 19 B. Gado, 1988; J. Devisse, 1993, p. 546. 20 Cf. e.g. R. Mauny, 1951; R. Rebuffat, 1974. 7The intriguing Janus bronze statuette found at Zangon Dan Makéri in southern Niger is another artefact found south of the Sahara which potentially may have derived from pre-Arab cross-desert contacts. Stylistically dated to 2nd century AD Roman North Africa,19 the circumstances of its discovery remain obscure. Without any knowledge of the archaeological context it derives from, it is not possible to conclude on whether it was really brought to the Sahel in Roman times, in the course of the medieval, Arab-driven trans-Saharan trade or even later. Indeed, the same is true for the sporadic Roman coin finds made here and there in the Sahara and in sub-Saharan Africa.20 Bare of any archaeological context, they are today not much more than amazing curiosities. To date, no Roman coin has ever been excavated at a West African sub-Saharan archaeological site. 21 Among others: R.C.C. Law, 1967; T. Lewicki, 1992, p. 152-153; D. Lange, 1992. 22 M. Liverani, 2000a, 2000b, 2005; D.J. Mattingly and A.I. Wilson, 2010. 8It is without dispute that there was a flow of trade goods from Roman North Africa into Garamantian territory, and vice versa. But is there secure archaeological evidence in the Sahara or north of it for pre-Arab Trans-Saharan trade too, i.e., trade goods from sub-Saharan Africa transported across the Sahara to North Africa? The Garamantes have been often cited as having played the role of middlemen in a very old and organised trade between northern and inner Africa.21 A number of archaeologists working in the Fezzan and on its southern boundaries have indeed openly advocated, or at least uncritically agreed on, the existence of Garamantian long-distance trade between both sides of the Sahara.22 However, looking closely at the archaeological evidence on which the alleged trade contacts between the Garamantian core territory in southwest Libya and the sub-Saharan region is based, it becomes clear how fragile the arguments in favour of such an ancient connection presently are. 9In fact, and to start with, there is so far no hard and verifiable evidence of items of West African origin traded into Garamantian territory.23 Beyond the insecure interpretation of classical documents, much of the archaeological evidence, upon which the hypothesises around a putative Garamantian long-distance trade rests, refers to the sites of the Wadi Tanezzuft in southwestern Fezzan. Due to its fortified character and location on an ancient commercial route used in medieval times, the excavators considered the citadel of Aghram Nadharif to be a kind of gate that funnelled and controlled the flow of goods coming from the south.24 Archaeological finds that could have substantiated this line of reasoning were, however, not retrieved from the excavations carried out at that location. Accordingly, the relation of Aghram Nadharif and of the Garamantes with a trans-Saharan trade still remains unproven. 26 For a recent overview, see A. Livingstone Smith, 2007. 27 A. Livingstone Smith, 2007; A. Haour et al., 2010. 28 G. Artioli et al., 2005, p. 257. 29 M. Liverani, 2005, p. 446. 30 M.C. Gatto, 2005, p. 237. 31 M. Liverani, 2005, p. 446. 33 M.C. Gatto, 2005, p. 239. 34 See for example O.P. Gosselain, 2000. 35 M.C. Gatto, 2005, p. 207. 37 M. Liverani, 2005, p. 446, 453. 10In spite of this, it is worth mentioning that the presence in the Wadi Tanezzuft Garamantian sites of roulette-impressed pottery shards has been seen as evidence for such contacts. Roulette impression indeed appears as the main decoration for pottery in the region from the Final Pastoral Phase onwards, i.e., the early first millennium BC.25 The technique of decorating pottery by cord roulettes is widespread throughout West Africa, both in time and space.26 However, neither the geographical limits of its use nor the mechanisms of its distribution between neighbouring regions are yet fully understood, although progress has been made in more recent years.27 The stylistic comparison of widespread decoration techniques such as cord roulette impressions is, in my opinion, a rather weak tie for making a case for trade between the Garamantes’ territory and the Sahel. Petrographical and chemical analysis of the cord roulette-impressed pottery matrix, on the other hand, is a logical step forward to verify the hypothesis that the Garamantes were trading with the far-distant south. The results of such analyses on material from Aghram Nadharif, however, do not support this hypothesis as they show that the relevant pottery was made from local clay.28 The same is true for some shards decorated with red and white paint, which M. Liverani seeks to link with those from the Inland Niger Delta and Djenné Jeno as well as with the Chad Basin,29 while M. C. Gatto rather explores connections between the painted cross-hatched motifs and similar motifs in the Borkou area.30 The fact that no pottery with truly Sahelian origin was found in the tested assemblage is explained by a trade with the south that neither involved pottery nor goods transported in pottery containers.31 Nevertheless, Liverani argues that frequent contacts with the Sahel triggered the use of these pottery decorations among the Garamantians in the first centuries AD.32 Gatto, on the other hand, rather suggests that female potters originating from the Sahel intermarried with Garamantians and kept their pottery traditions over generations.33 In principle, these possibilities cannot be fully dismissed without further substantial work on the diffusion of the cord roulette technique into Saharan Africa. However, it is important to note that decoration may be also in this case much less significant than pottery-making techniques for tracing back the origins of the people who made them.34 In this respect, the main shaping technique used at Aghram Nadharif – moulding/pinching and coiling35 – is not a common technique among the Sahelian pottery traditions claimed to relate to the Garamantians (Niger Bend, Lake Chad region). In most parts of those territories, the prevailing techniques during the time concerned (ca. 500 BC onwards) were variants of forming the body of a vessel over a convex or, more widespread, concave mould or form, often in combination with coiling of the upper vessel/rim part.36 M. Liverani37 assumes that, instead of pottery, mainly archaeologically invisible merchandise was traded between the Sahel, the Garamantian territory and beyond. These are thought to have consisted, as in medieval times, of salt, slaves and gold. 39 A. Gondonneau, M.F. Guerra, 2002. 11While the first two trade items mentioned by Liverani are actually relatively improbable to be recognised in the archaeological record, the third has at least a chance to do so. Indeed, whether West African gold once did reach pre-Arab North Africa is difficult, but not impossible, to verify. Already in the 1980s, T. Garrard tried to explain a peak in Carthaginian gold mint issues with the export of gold from regions south of the Sahara to North Africa.38 A. Gondonneau and M. F. Guerra analysed North African gold coins from different periods, including a few of the very last Byzantine ones and such from the first Arab dynasties.39 The chemical fingerprint of the gold coins was also compared with modern gold nuggets from Ghana, Ivory Coast and Mali. According to their analyses, the first West African gold reached North Africa in the middle of the 8th century AD.40 Older gold artefacts than the last coins issued by the Byzantines were not tested, nor were gold nuggets from the eastern Niger Bend. Thus, the analyses only show that native gold from Ghana, Ivory Coast (i.e., the Upper Volta or Mouhoun River gold) and Mali (the Upper Niger gold) was most likely not traded to North Africa before the 8th century AD. This fits well with the archaeological record, for no trade items from northern Africa were found in those southern regions before the 8th century AD either. Since trade items from northern Africa and the wider world were discovered at the eastern Niger Bend prior to the 8th century AD, and since native gold is found there in abundance, it would be interesting to know whether gold from that area matches chemically with pre-Arab North African gold coins. 42 J.-M. Regnoult and D. Bory Kadey, cited in J. Devisse, 1993, annexe 2. 43 S. Nixon, 2009; S. Nixon et al., 2011. 44 N. Levtzion, J.F.P. Hopkins, 1981, p. 85. 45 S. Nixon, 2009; S. Nixon et al., 2011. 12Another interesting question is whether there is archaeological evidence for the exploitation of the eastern Niger Bend gold deposits prior to the onset of the Arab trans-Saharan trade. First attempts to solve the latter problem were made by J. Devisse, reporting on the middle Sirba River in Burkina Faso.41 However, the only known archaeological site possibly related to gold exploitation was relatively young, merely dating to the ca. 14th–15th century AD.42 That gold from the eastern Niger Bend was possibly traded towards the north by the onset of the Arab trans-Saharan trade is also assumed by S. Nixon.43 Excavating in the medieval Saharan merchant town of Essouk/Tadmekka in eastern Mali, he discovered direct archaeological evidence for the local production of the “bald dinars”, a process later on described by the geographer al-Bakri44 (11th century AD). Dating to the 9th–10th century AD, Nixon’s finds are so far the oldest hard evidence for trade in gold on the borderland between the Sahel and the Sahara.45 In this respect, and as Essouk/Tadmekka is situated just to the north of the eastern Niger Bend, a contemporary and pre-9th century AD trade in gold from the gold-bearing tributaries of the Niger River such as the Sirba and Dargol has to be seriously considered. 13In 2008, an archaeological site on the lower Sirba River in Niger, close to its confluence with the River Niger, was discovered by the author and colleagues, and test-pitted in the following year. Named Garbey Kourou after the adjacent village, the site consists of two near settlement mounds, located at an elevated point on the northern bank of the Sirba River (figure 3). In the direct vicinity of the site, modern gold-diggers still pan gold dust from the river bed during the dry season (figure 4). Two test-pits dug at each of the mounds revealed stratified material throughout the mound deposits, reaching down to depths of 1.2m (Test pit A) and at least 2.6m (Test pit B46). A series of radiocarbon dates indicates that the mounds were formed between the 4th and 11th centuries AD. In Test pit B, a refuse pit radiocarbon-dated to the ca. 4th to 6th century AD was found. Along with potshards, faunal and charred botanical remains, it also contained several fragments of clay crucibles. The crucibles were obviously discarded in the pit after having been used, but what was being melted in them has not yet been satisfactorily determined. A microscopical analysis, conducted by E. Pernicka from CEZ Mannheim, revealed the sporadic presence of copper, silver and gold flitters in the pores of the crucible walls, but none of these flitters showed traces of melting. An XRF-study is currently undertaken on a larger number of crucible fragments in order to trace the material processed in the crucibles. 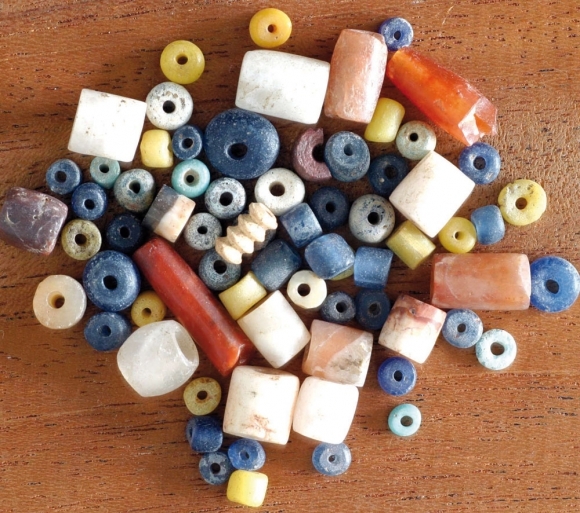 Since a small glass bead was likewise found in the same pit, it is obvious that, as at Kissi, the inhabitants of the Sirba valley were receiving goods from North Africa as early as the 4th to 6th century AD. 14It is tempting to presume that the ancient metal workers at Garbey Kourou already mined, processed and exchanged gold from the riverbed nearby for the exotic goods from the north. In the case that such a notion can be substantiated through new finds, this would be a considerable step towards solving the long lasting discussion about an ancient gold trade between West and North Africa prior to the Arab conquest of North Africa. Obviously, more comprehensive archaeological fieldwork at this site is required for ascertaining the kind of metal being processed there in the past. In addition, investigations at other contemporaneous sites in the region are necessary to pursue the initial traces brought to light at Garbey Kourou. Regrettably, the security problems that have flared up in large part of the Sahel and Saharan regions in the last five years have prevented the continuation of the research from 2010 on. It can only be hoped that the situation will improve in the years to come and that the continuation of fieldwork in the area around Garbey Kourou will provide further and better data than we were able to obtain to date. A detailed report on the Garbey Kourou finds described above will appear in the proceedings of the conference ’Connections, Contributions and Complexity: Africa’s Later Holocene Archaeology in Global Perspective’ to be held from the 21st to the 23rd of September 2012 in Cambridge, UK. 15It has long been known that glass beads, copper alloys and cowries were important trade goods brought into West Africa during the Arab-driven trans-Saharan trade. However, there is now archaeological evidence showing that the same kind of artefacts started arriving in the region prior to the onset of that organised commerce. Currently, the largest part of these earliest finds comes from the eastern Niger Bend. It still remains unclear how they found their way through the Sahara into the West African Sahel, but it is tempting to suggest that an incipient trade in such luxury goods had already started at that time. Perhaps ancient Saharan people like nomad proto-Berbers acted in pre-Arab times as middlemen who, like links of a chain, connected both margins of the desert, informally exchanging goods along a number of stages. At least technically, direct and somewhat organised trade might have become possible from the 3rd century AD on, as from that time dromedaries appear both in North and West Africa.47 Despite a significant increase in the number of items arriving into the eastern Niger Bend between the 4th-7th centuries AD (see above Kissi), convincing evidence for such a direct trade is, however, still lacking. 16The general paucity of adequate evidence at pre-7th to 8th century sites located on both margins of the Sahara is a large obstacle in ascertaining which products might have been then transported north in exchange for those coming to the south. Slaves and gold may well have been a factor as in later times, but there is as yet no single evidence for this. At least in the case of gold, two lines of research may be critical in approaching this problem: first, comprehensive archaeological fieldwork at key sites at the eastern Niger Bend, i.e., the region where, based on the evidence available so far, I presume that the first contacts and exchanges took place; second, archaeometrical analysis of northern African Roman and Byzantine gold coins and of samples from Niger Bend gold sources. Adams, J.N., 1994, “Latin and Punic in contact? The case of the Bu Njem ostraca”, Journal of Roman Studies, 84, p. 87-112. Artioli, G., Laddaga, L., Dapiaggi, M., 2005, “Archaeometry of pottery: mineralogical and chemical analyses”, in M. Liverani (ed. ), Aghram Nadharif. The Barkat Oasis (Sha’abiya of Ghat, Libyan Sahara) in Garamantian Times, The Archaeology of Libyan Sahara Volume II, Arid Zone Archaeology Monographs 5, Florence, All’Insegna del Giglio, p. 249-257. Brill, R.H., 1995, “Chemical analyses of some glasses from Jenné jeno”, in S.K. McIntosh (ed. ), Excavations at Jenné-Jeno, Hambarketolo, and Kaniana (Inland Niger Delta, Mali), the 1981 Season, Berkeley, University of California Press, p. 252-256. Devisse, J., 1992, “Trade and trade routes in West Africa”, in I. Hrbek (ed. ), General History of Africa III: Africa from the Seventh to the Eleventh Century, Abridged edition, London, James Currey/UNESCO, p. 190-215. Devisse, J., 1993, “L’or”, in J. Devisse, (ed. ), Vallées du Niger, Paris, Éditions de la réunion des musées nationaux, p. 344-357. Fenn, T.R., Killick, D.J., Chesley, J., Magnavita, S. and Ruiz, J., 2009, “Contacts between West Africa and Roman North Africa: Archaeometallurgical results from Kissi, Northeastern Burkina Faso”, in S. Magnavita, L. Koté, P. Breunig and O.A. Idé (eds), Crossroads/Carrefour Sahel. Cultural and technological developments in first millennium BC/AD West Africa. Développements culturels et technologiques pendant le premier millénnaire BC/AD dans l’Afrique de l’Ouest, Journal of African Archaeology Monograph Series 2, Frankfurt am Main, Africa Magna Verlag, p. 119-146. Ferguson, J., 1969, “Classical contacts with West Africa”, in L.A. Thompson and J. Ferguson (eds), Africa in classical antiquity: nine studies, Ibadan, Ibadan University Press, p. 1-25. Fuller, D.Q., 2003, “African crops in prehistoric South Asia: a critical review”, in K. Neumann, A. Butler and S. Kahlheber (eds), Food, Fuel and Fields: Progress in African Archaeobotany, Africa Praehistorica 15, Köln, Heinrich Barth Institut, p. 239-271. Gado, B., 1988, “Hypothèses de contacts entre la vallée moyenne du Nil et la région du fleuve Niger”, Libya antica, Histoire générale de l’Afrique, étude et documents, 11, p. 203-250. Gado, B., 1993, “Un village des morts à Bura en République du Niger. Un site méthodiquement fouillé fournit d’irremplaçables informations”, in J. Devisse (ed. ), Vallées du Niger, Paris, Éditions de la réunion des musées nationaux, p. 365-374. Gado, B., Maga, A., Idé, O.A., 2000, Niger, Éléments d’archéologie ouest-africaine IV, Niamey, DARA/IRSH. Gatto, M.C., 2005, “The local pottery”, in M. Liverani (ed. ), Aghram Nadharif. The Barkat Oasis (Sha’abiya of Ghat, Libyan Sahara) in Garamantian Times, The Archaeology of Libyan Sahara Volume II, Arid Zone Archaeology Monographs 5, Florence, All’Insegna del Giglio, p. 201-240. Garrard, T., 1982, “Myth and Metrology: the early trans-Saharan gold trade”, Journal of African History, 23 (4), p. 443-461. Gondonneau, A., Guerra, M.F., 2002, “The circulation of precious metals in the Arab Empire: the case of the Near and the Middle East”, Archaeometry, 44 (4), p. 573-599. Gosselain, O.P., 2000, “Materializing identities: An African perspective”, Journal of Archaeological Method and Theory, 7, p. 187-217. Haour, A., Manning, K., Arazi, N., Gosselain, O., Guèye, N.S., Keita, D., Livingstone Smith, A., MacDonald, K., Mayor, A., McIntosh, S., Vernet, R. (eds), 2010, African Pottery Roulettes Past and Present. Techniques, Identification and Distribution, Oxford, Oxbow Books. Insoll, T., 2000, Urbanism, Archaeology and Trade: Further Observations on the Gao Region (Mali), the 1996 Fieldseason Results, Oxford, BAR International Series. Lange, D., 1992, “The Chad region as a crossroads”, in I. Hrbek (ed. ), General History of Africa III: Africa from the Seventh to the Eleventh Century, Abridged edition, London, James Currey/UNESCO, p. 216-225. Law, R.C.C., 1967, “The Garamantes and Trans-Saharan Enterprise in Classical Times”, The Journal of African History, 8 (2), p. 181-200. Levtzion, N., Hopkins, J.F.P. (eds), 1981, Corpus of early Arabic sources for West African history, Cambridge, Cambridge Historiae Africanae, Series Arabica 4. Lewicki, T., 1992, “The role of the Sahara and Saharians in the relationships between north and south”, in I. Hrbek (ed. ), General History of Africa III: Africa from the Seventh to the Eleventh Century (abridged edition), London, James Currey/UNESCO, p. 146-162. Liverani, M., 2000a, “Looking for the southern frontier of the Garamantes”, Sahara, 12, p. 31-44. Liverani, M., 2000b, “The Libyan caravan road in Herodotus IV. 181-185”, JESHO, 43 (4), p. 496-520. Liverani, M. (ed. ), 2005, Aghram Nadharif. The Barkat Oasis (Sha’abiya of Ghat, Libyan Sahara) in Garamantian Times, The Archaeology of Libyan Sahara Volume II, Arid Zone Archaeology Monographs 5, Florence, All’Insegna del Giglio. Livingstone Smith, A., 2007, “Histoire du décor à la roulette en Afrique subsaharienne”, Journal of African Archaeology, 5 (2), p. 189-216. MacDonald, K.C., MacDonald, R.H., 2000, “The origins and development of domesticated animals in arid West Africa”, in R.M. Blench, K.C. MacDonald (eds), The origins and developments of African livestock: archaeology, genetics, linguistics and ethnography, London, University College London Press, p. 127-162. MacDonald, K.C., 2011, “A view from the South. Sub-Saharan evidence for contacts between North Africa, Mauritania and the Niger, 1000 BC–AD 700”, in A. Dowler, E.R. Galvin (eds), Money, Trade and Trade Routes in Pre-Islamic North Africa, London, British Museum Research Publication, British Museum Press. Magnavita, C., 2002, “Recent archaeological finds of domesticated Sorghum bicolor in the Lake Chad region”, Nyame Akuma, 57, p. 14-20. Magnavita, S., 2006, 1500 Jahre am Mare de Kissi. Eine Fallstudie zur Besiedlungsgeschichte des Sahel von Burkina Faso, Ph.D. thesis, J.W. Goethe University, Frankfurt am Main / Fachbereich Sprach-und Kulturwissenschaften. Magnavita, S., 2008, “The oldest textiles from sub-Saharan West Africa: woolen facts from Kissi, Burkina Faso”, Journal of African Archaeology, 6 (2), p. 243-257. Magnavita, S., 2009, “Sahelian Crossroads: Some aspects on the Iron Age sites of Kissi, Burkina Faso”, in S. Magnavita, L. Koté, P. Breunig, O.A. Idé (eds), Crossroads/Carrefour Sahel. Cultural and technological developments in first millennium BC/AD West Africa. Développements culturels et technologiques pendant le premier millénaire BC/AD dans l’Afrique de l’Ouest, Journal of African Archaeology Monograph Series 2, Frankfurt am Main, Africa Magna Verlag, p. 79-104. Magnavita, S., Hallier, M., Pelzer, C., Kahlheber, S., Linseele, V., 2002, “Nobles, Guerriers, Paysans. Une nécropole de l’Âge de Fer et son emplacement dans l’Oudalan pré- et protohistorique”, Beiträge zur Allgemeinen und Vergleichenden Archäologie, 22, p. 21-64. Manning, K., 2010, “A developmental history for early West African agriculture”, in P. Allsworth-Jones (ed. ), West African Archaeology: New Developments, New Perspectives, Oxford, Archaeopress, p. 43-52. Manning, K., Pelling, R., Higham, T., Schwenniger, J.-L., Fuller, D.Q., 2011, “4500-Year old domesticated pearl millet (Pennisetum glaucum) from the Tilemsi Valley, Mali: new insights into an alternative cereal domestication pathway”, Journal of Archaeological Science, 38 (2), p. 312-322. Mattingly, D.J., Wilson, A.I., 2010, “Concluding thoughts: made in Fezzan?”, in D.J. Mattingly (ed. ), The Archaeology of Fazzan. Volume 3: The Excavations of C.M. Daniels, London, The Society for Libyan Studies / Department of Antiquities, p. 523-530. Mauny, R., 1951, “Monnaies anciennes trouvées en Afrique au sud du limes de l’empire romain”, in Comptes rendus de la conférence internationale des Africanistes de l’Ouest 5, vol. 2, Fernando Poo, p. 51-70. Mauny, R., 1970, Les siècles obscurs de l’Afrique Noire, Paris, Fayard. Mauny, R., 1978, “Les contacts terrestres entre Méditerranée et Afrique tropicale occidentale pendant l’antiquité”, in Afrique noire et monde méditerranéen dans l’antiquité. Colloque de Dakar : 19-24 janvier 1976, Dakar/Abidjan, Les Nouvelles Éditions Africaines, p. 122-135. Mayor, A., 2011, Traditions céramiques et histoire du peuplement dans la boucle du Niger (Mali) au temps des empires précoloniaux, Journal of African Archaeology Monograph Series 7, Frankfurt am Main, Africa Magna Verlag. McIntosh, S.K. (ed. ), 1995, Excavations at Jenné-Jeno, Hambarketolo, and Kaniana (Inland Niger Delta, Mali), the 1981 Season, Berkeley, University of California Press. Moraes Farias, P.F. de, 1974, “Silent Trade: Myth and historical evidence”, History in Africa, 1, p. 9-24. Neumann, K., 2005, “The romance of farming: plant cultivation and domestication in Africa”, in A.B. Stahl (ed. ), African Archaeology: A Critical Introduction, Malden, Blackwell Publishing, p. 249-275. Nixon, S., 2009, “Excavating Essouk-Tadmakka (Mali): new archaeological investigations of early Islamic trans-Saharan trade”, Azania: Archaeological Research in Africa, 44 (2), p. 217-255. Nixon, S., Rehren, Th., Guerra, M.F., 2011, “New light on the early Islamic West African gold trade: coin moulds from Tadmekka, Mali”, Antiquity, 85 (330), p. 1353-1368. Pelling, R., 2008, “Garamantian agriculture: the plant remains from Jarma, Fazzan”, Libyan Studies, 39, p. 41-71. Rebuffat, R., 1974, “Vestiges antiques sur la côte occidentale de l’Afrique au sud de Rabat”, Antiquités africaines, 8, p. 25-49. Robertshaw, P., Magnavita, S., Wood, M., Melchiorre, E., Popelka-Filcoff, R., Glascock, M.D., 2009, “Glass beads from Kissi (Burkina Faso): Chemical analysis and archaeological interpretation”, in S. Magnavita, L. Koté, P. Breunig, O.A. Idé (eds), Crossroads/Carrefour Sahel. Cultural and technological developments in first millennium BC/AD West Africa. Développements culturels et technologiques pendant le premier millénaire BC/AD dans l’Afrique de l’Ouest, Journal of African Archaeology Monograph Series 2, Frankfurt am Main, Africa Magna Verlag, p. 105-118. Salama, P., 1981, “The Sahara in classical antiquity”, in G. Mokhtar (ed. ), General History of Africa II, Ancient Civilizations of Africa, Unesco/Heinemann, p. 514-532. Shaw, T., 1976, “The prehistory of West Africa”, in J.F.A. Ajayi, M. Crowder (eds), History of West Africa, I, Harlow, Longman Group, p. 48-86. Sterner, J., David, N., 2003, “Action on matter: the history of the uniquely African tamper and concave anvil pot-forming technique”, Journal of African Archaeology, 1 (1), p. 3-38. Swanson, J.T., 1975, “The myth of trans-Saharan trade during the Roman era”, The International Journal of African Historical Studies, 8 (4), p. 582-600. Van der Veen, M., 2011, Consumption, Trade and Innovation. Exploring the Botanical Remains from the Roman and Islamic Ports at Quseir al-Qadim, Egypt, Frankfurt am Main, Journal of African Archaeology Monograph Series 6, Africa Magna Verlag. 2 Cf. e.g. R.C.C. Law, 1967; J.T. Swanson, 1975; T. Shaw, 1976; T. Garrard, 1982; but see also P.F. de Moraes Farias, 1974, for a critical view. 3 The problem of interpreting the reports of classical authors such as Herodotus, Strabo, Ptolemy and Pliny on Saharan and possibly sub-Saharan Africa is complex; among others see for example R. Mauny, 1970, 1978; J. Ferguson, 1969; P. Salama, 1981. The fact is that none of the reported locations beyond the desert could be identified with certainty. Even for such seemingly palpable locations as Agysimba or the river Nigeir, the highly speculative identifications cover areas in the whole northern third of the African continent and its entire width; see R. Mauny, 1978. 11 Glass, for example, became more and more frequent in post-9th c. AD archaeological contexts, like at Gao, where even window glass was found (T. Insoll, 2000) and at Essouk/Tadmekka (S. Nixon, 2009). 14 At Siouré, a “charred first phalanx” (K.C. MacDonald and R.H. MacDonald, 2000, p. 141) of a dromedary was recovered and at Cubalel, “a small, complete metatarsal” (ibid., p. 140) of an equid, most likely a donkey, has been found. 23 The occurrence of pearl millet (Pennisetum glaucum) and, more tentatively, sorghum (Sorghum bicolor) in the heartland of the Garamantian kingdom (at the archaeological sites of Jarma and Tinda) in the late 1st millennium BC (R. Pelling, 2008) cannot be considered as direct imports or trade commodities, but is nevertheless noteworthy. Likely domesticated somewhere in the Sahelo-Saharan borderland of western Niger and eastern Mali, the earliest domesticates of Pennisetum glaucum arrived in the Lower Tilemsi Valley around the 2nd half of the 3rd millennium BC (K. Manning, 2010; K. Manning et al., 2011). The domesticated crop spread quickly across Africa and reached India still in the late 3rd millennium BC (D.Q. Fuller, 2003; K. Manning, 2010). The earliest evidence of Sorghum bicolor, although being native to tropical Africa, occurs in mid-2nd millennium India (D.Q. Fuller, 2003), while its currently oldest, tentatively identified occurrence on the African continent is more than a thousand years younger (at Jarma and Tinda, as stated above), and even more so in the Nile Valley and sub-Saharan Africa (S.K. McIntosh, 1995; C. Magnavita, 2002; K. Neumann, 2005). According to Marijke Van der Veen, these crops were ‘introduced’ into Northern Africa, “by which is meant that they became incorporated into local agricultural systems and were cultivated in Egypt and other parts of North Africa and the Middle East, rather than acquired through repeated imports.” (M. Van der Veen, 2011, p. 75). According to Ruth Pelling (R. Pelling, 2008), there is a “potential for trade as a means of early diffusion of crops”. It is beyond the scope of this paper to open up a debate about the history of millet cultivation, or other similarly controversial themes like the spread of domesticated chicken, bananas, or iron metallurgy. 25 M.C. Gatto, 2005, p. 238-239; neither the specific type of roulette nor the employed action – rolling or simple impressing – has been identified yet, both of which are essential for tracing possible affinities with other regions. 36 A. Mayor, 2011; for an overview on vessel building techniques at the Niger bend; J. Sterner, N. David, 2003. 46 While at 1.20m in Test pit A the sterile ground was reached, the sounding of Test pit B had to be stopped at 2.60m before reaching sterile ground because of the small scale of the unit. 47 There is textual evidence on ostraca for Garamantes entering the Roman fort of Bu Ngem (Gholaia) with packed dromedaries, dated to the 3rd century AD (J.N. Adams, 1994). New archaeozoological evidence from the Garamantes capital Garama / Old Jarma apparently dates the introduction of dromedaries into the Fezzan to the 1st to 2nd centuries AD (Britton and Grant, cited in R. Pelling, 2008, p. 66, as forthcoming but not yet published).